This is the fourth installment of a four-part series. 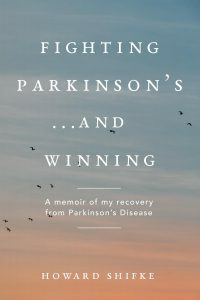 If you have not read Fighting Parkinson’s, and dissecting the disease, part 1 of 4, you may click here and read it now. If you have not read Fighting Parkinson’s, and dissecting the disease, part 2 of 4, you may click here and read it now. If you have not read Fighting Parkinson’s, and dissecting the disease, part 3 of 4, you may click here and read it now. Reading parts 1 through 3 first will give you a better understanding of how Parkinson’s affects the body and how the Recipe for Recovery heals the body and heals and calms the mind. In part 1, I outlined how the electricity is flowing through the body, and how the low-level dopamine sets off a chain reaction of tremors, rigidity, pain, stiffness and slowness. When our electricity is not flowing properly, the messages are not getting to our limbs and we do not move our extremities well, and the electrical impulses are not getting the correct messages to our organs and they do not function well, either. In part 2, I outlined how the Recipe for Recovery is designed to heal the body. In part 3, I outlined how the Recipe for Recovery is designed to heal and calm the mind. We now will look at how the Recipe for Recovery helps us reconnect with the soul and open our dopamine faucet for full dopamine flow and finalization of full recovery. I began my recovery journey with faith in my full recovery. I considered this to be the beginning of healing my soul, which really was a reconnecting with my soul, or the essence of my being; reconnecting, that is, with the essence of who I was before I started making changes to the essence of my being. I feel we are born with a purity and innocence that we adjust and change and lose somewhere in life, and it is the return to that beginning, the re-connection with that beginning, that re-purifies us and helps up re-connect with our soul — Parkinson’s is toxic, and it is this Recipe for Recovery re-purification of the body (part 2 of 4), re-purification of the mind (part 3 of 4), and re-connection with the purity of the soul that purifies us entirely…and then there is no Parkinson’s…it only can reside in a toxic environment…it has to leave. And we are liberated! Our bodies are accumulations of food and drink, etc. over the course of our lives. Our bodies have Parkinson’s symptoms. We are not those bodies. Our minds are accumulations of thoughts and ideas and emotions and fears, etc. over the course of our lives. Our minds have Parkinson’s negative emotions and fears. We are not those minds. Our souls, the essence of who we are, remain pure. However, as a result of being so focused in life on what is going on with our bodies and our minds, we make adjustments to the pure and innocent essence of our beginnings, and our souls gets buried deep inside us. But It is there, and always has been with us. And It remains pure and untouched by Parkinson’s. So, whatever is your belief system, the Recipe for Recovery healing of the soul can work for you. It does not matter if you believe in a soul or essence. It does not matter if you believe in a Higher Power or God, or Greater Consciousness or that we are just here in this world — there is something inside every one of us — that something deep inside that when we have faced insurmountable odds in life, we have reached down deep inside and felt that something, and we defied all logic, and accomplished whatever it was that nobody thought was possible. Trust. We trusted in ourselves. And we had faith we would do whatever needed to get done. And we dug down deep and found whatever It was inside to give us the ability to reach the end. It is that spark inside us. That spark we used to go to when we needed a boost of energy or a smile on our face in hard times or that sense that there was a greater purpose in why we all are here. Some people call that spark soul; some call It essence; some call It a part of God or the Higher Power or the Divine; some call It part of the Greater Consciousness; some call It an electrical charge. It does not matter what you call It, It is there, and you need to re-connect to It and know It will help you in your recovery. It is the basis of faith. My recovery journey began with faith. I knew in my heart and soul I would recover. I have no other explanation. I just knew it. And every day I worked at doing the Recipe for Recovery because I knew it was my vehicle on the path to my recovery. I am hopeful that parts 1-3 of this 4-part series of posts have reinforced your faith and resolve to know that the Recipe for Recovery is your vehicle on the path to your recovery from Parkinson’s. After a number of months of doing the body healing part of the Recipe for Recovery, I knew that my body was healed on the inside. My energy was better, my bowel issues were corrected, my urgent urination issue was corrected, my indigestion was corrected, and I had my wonderful sense of smell returned. “Wake up and smell the coffee” literally took on a completely new and wonderful meaning for me. Mostly, it had been an expression used by others who doubted the efficacy of the path I was on…how delightful that it actually was one of the things that proved the path was the correct one. At this point in my recovery, I became a bit confused. I had expected that when my body was healed on the inside, my symptoms would go away. However, they were still there in full force. It was then that I realized that even though I had “healed my soul” from the standpoint of complete faith in my recovery, and even though I had “healed my mind” from the standpoint of eliminating negative emotions, my mind was still full throttle in Adrenaline Mode, and my heart was still closed to self-cultivating positive emotions. I discussed the calming of the mind in part 3, which took care of my Adrenaline Mode mind. However, opening my heart for cultivating positive emotions was the key to opening my dopamine faucet and finishing my recovery. Here is how I did it. I realized that in my wanting to be liked and loved and accepted by others, I had been achieving my “happiness” in the form of feedback from accomplishments. This self-perpetuated into the adrenaline driven behavior that helped me get Parkinson’s — always thinking of the next scenario, or juggling act, to keep the “I can do anything to keep other people happy so they will give me positive feedback and keep me happy” balls in the air. Quite frankly, I had to admit to myself how lost I was in who I was anymore. And, I had to know why did I not like me? I would like to say because of Parkinson’s, but that is not accurate. I did not like me before Parkinson’s. Parkinson’s only gave me a new excuse. I needed to get to the root of the problem, so I decided to explore the things in life that gave me a feeling that I did not deserve, or was not worthy, of good things happening to me, including Parkinson’s recovery. Essentially, I looked back at my life to see if there were times when things were said or done that made me feel bad about myself. I do not know much about the subconscious, but it was my understanding that if I felt bad about myself and left those feeling unresolved, they could grow over time into a subconscious feeling of being undeserving or unworthy of my final recovery. I found some times where things were said and the net result was that I did not feel good about myself, and I worked them through and gave them finality. I did feel better about myself after having accomplished this. With this potential blockage out of the way, I was open to the realization that we all are connected at some level and the best way I could start to open my heart and cultivate from the inside the positive emotions of happiness and joy and compassion and gratitude was to share these with other people. However, this was much different than the “doing things for others so they would give me feedback so I could be happy” scenario that helped me get Parkinson’s…this was very much different. This came from the realization that there was a substantial likelihood that every person I came in contact with was suffering at some level…physically, mentally, and/or spiritually. I sensed that if I could assist people in feeling a little better about their own level of suffering, my suffering would become less because it would open my heart and my dopamine would flow better. It would bring me closer to God and closer to re-connecting with the It inside me. So, I did what many of us do not want to do — I found a place with people and talked to them…really talked to them…introduced myself with a big smile and sincerely asked them how they were doing. And, people were responsive, and my heart opened from the absolute joy of helping other human beings feel a little better about their situations in life. They knew they were not alone because this stranger actually seemed genuinely concerned with how they were doing and was compassionate over their situation. It was amazing. I started easy — talking to the cashiers and baggers at the grocery store. But it made me feel so good to see the smiles light up on people’s faces, I started talking to anybody I could. Yes, some people looked at me with questioning eyes and walked the other way, but most people warmed up to the idea of having a chat. It was my realization that we all are connected in this life, but that we spend so much time disconnecting ourselves from the other people. In re-connecting with other people and helping them feel a little better about their lives, I began to re-connect with my soul, the essence of who I was, and it felt great! And my dopamine began to flow. One day when I wasn’t paying attention, I walked down the stairs and back up without holding on for the first time in 8 months. On another day, I was pushing a shopping cart and it felt like it suddenly got turbo-charged and we flew down the aisle — I had not walked like that in 8 months. And then it hit me…in staring at these words, I asked myself, “Where is the guy who knows he will be fully recovering from Parkinson’s? How is he now the guy describing his Parkinson’s as a life-long battle?” And it came to me — many people had been so negative and so disbelieving of my fighting Parkinson’s without medications, that I had fallen back into my old “safe-place” habit when faced with potential disapproval…I had become willing to keep Parkinson’s to my detriment just to make other people happy because if they were already negative toward me just with what I was doing in my treatment, how would they act toward me when I fully recovered. That was over two years ago. I have not been doing the Recipe for Recovery, and I remain symptom free. It was in my moment of realization at the end that I was able to connect my soul, my essence, my inner spark, to God, the Higher Power, the Universe, the Greater Consciousness, the healing electricity flowing around us and through us, and feel that I was a part of everything just as I was when my soul and my heart and my essence first were inside me. And my old-self Parkinson’s was not longer there…just I remained…symptom free, fully recovered. And you have not let go of It. Now, it is time for you to explore within yourself what may be holding you back from your full recovery. If you do not feel like you are deserving or worthy of this recovery, then you need to explore why, and get it resolved. It starts with faith, and It ends with faith. Faith is a choice, and it is the choice that leads you on your path with the Recipe for Recovery toward your recovery from Parkinson’s. Choose faith over fear. Thank you so much for your clarity on the soul aspect of recovery.I have been trying to surrender my ego to a higher power for some months but my ego keeps hanging on. You have explained it in a most useful and helpful manner and I will keep at it until I send Parkinsons away for good. Dear, dear Howard….. how serendipitous this message is! I’m really celebrating this morning! For the first time in years, I literally leaped out of bed this morning….. and my walking is so much better! Something weird and wonderful happened last night (or given your post today, perhaps not so weird as I’ve been doing a lot of soul work recently)…. I’m enlivened, hopeful, trusting…. willing to persist with the recipe as I have been doing for a year now until every PD symptom has left me. Thank you for your wonderful guidance, coaching, support and wisdom! I think this is my favorite post of yours so far. I cannot wait for those you are coaching and those who are following your recipe and blog to recover, because then they, too, will be their most loving and most powerful selves. Sending blessings for reconnection to all of you out there! You are worth it, as Howard says. The rest of us need your gifts, even those of us whom you have never met. We need to be inspired by your example so we, too, can learn to show up as our most loving, most powerful selves. i agree with penny. you are a wonderful guide,coach and support to everyone. Dear Howard, WOW!! Having been away for awhile, I just read parts 1-4 of this remarkable discourse. The clarity and simplicity are wonderful, and a real gift to those who are following the Recipe for Recovery or are considering it. Of course I recognized my old Parkinson’s self in a lot of what you said, especially in Part 3 about the layering of anger when things did not go your way. When my good fortune led me to your posts for the first time, it was shocking to me to take an honest look at myself and recognize how angry, critical, and even bitter I had become, even though I did a pretty good job of hiding it, definitely from other people, and also from myself. Looking back, I think my ego was attached to Parkinson’s partly because I had been doing so much caring for other people who were sick and/or dying… driving myself, exhausting myself…that I was saying “What about me? Look, I am sick too!” The disease gave me an excuse for putting myself first. How sad that I had let myself get to the point where I needed an excuse. And how great not to be there now! How great to have taken the time, given myself the precious gift of committing myself to the Recipe for Recovery. And to have recovered fully. How grateful I am, Howard, that you shared this with me, and go on inspiring others to heal. Since I am cured, I also do not do the Recipe for Recovery anymore, though I did it fully and faithfully during recovery. I still get angry at times, but since I don’t have the stored load of toxicity in my body, it suffices to just acknowledge the feeling and ask my liver to let it go. Cultivating my dopamine stores, which I learned here, feels so good and helps me stay balanced in every part of my life. Likewise, I still do Qigong and meditation, both of which which I was introduced to through the Recipe for Recovery; they are part of enhancing my life. I have moved past the disease, left it behind. I will never move past my gratitude, a treasure I hold in my heart. Thank you, Howard, for your generosity to me and everyone else who benefits from this Website. The story of your opening your heart to other people and their suffering and really taking an interest in them is so beautiful. You are a remarkable person! Marie,thank you for your insights and your honesty. Thank you Howard for giving me the courage to say “No!” to Parkinson’s! I am still in recovery, but I am so happy! I know if I am not happy I won’t recover. Your work is an act of love and a wonderful example for us in recovery. WOW, so true! Thank you for sharing, lots of food for a thought.